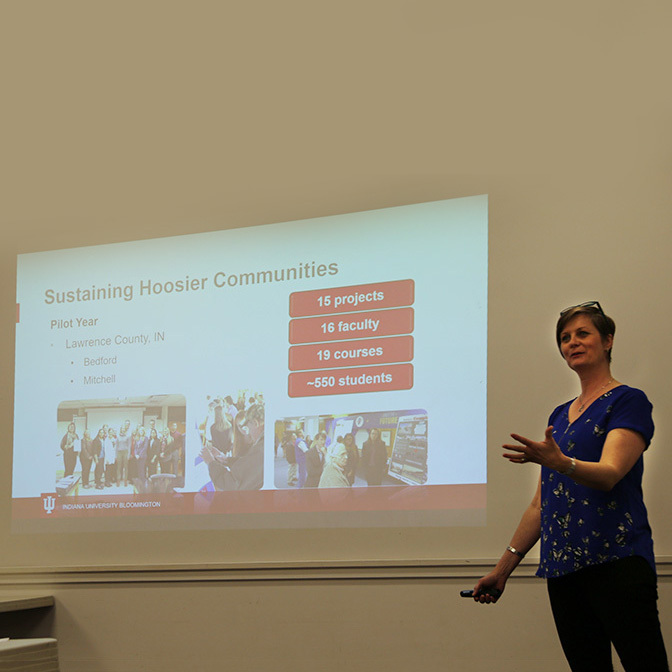 Dozens of Orange County residents joined an informational discussion Tuesday at the Orange County Community Center to learn more about the Indiana University Sustaining Hoosier Communities program, which is set to partner with the county starting this fall. An initiative of the Center for Rural Engagement and based on the EPIC-N model, Sustaining Hoosier Communities is a year-long collaboration between IU Bloomington students, faculty and staff and a community selected through an application process. Community-identified projects are paired with IU Bloomington courses to address opportunities and challenges and achieve community goals. Tuesday’s meeting offered an overview of the program, process and the list of community-identified projects that are based on a vision for greater health and prosperity in the county. Possible projects include community gardens, accessible playgrounds, rural health and wellness programs and tourism opportunities. Final project plans will be announced in the fall as courses start work in the county. The Center for Rural Engagement will seek to work with the community on projects that fall outside of the course-partnership model. The Center for Rural Engagement connects the broad resources of IU Bloomington and its region through collaborative initiatives. The goal of the center is to improve the lives and opportunities of Hoosiers. The center works with partners to discover and deploy scalable and flexible solutions to common challenges facing rural communities. The center will connect with communities to build upon their many opportunities and assets, such as the natural beauty of the region; their family-friendly community culture; and their many economic resources.